Another obstacle in the “Jim Crow obstacle course” was driving to the polls. The exhibit said that rumors would circulate on election day that black drivers would all be stopped; they were plausible enough, since harassment by the police and vigilantes was common. 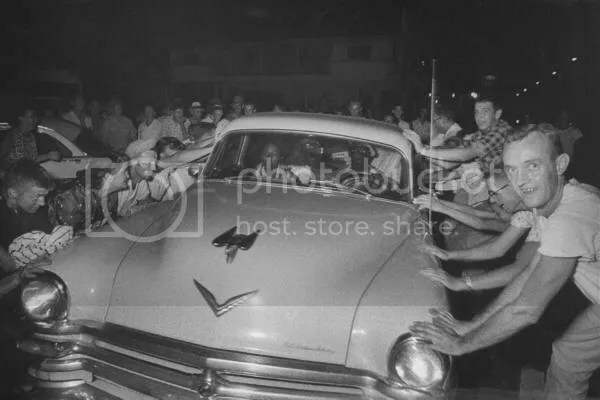 It also featured this chilling photo, from Life, showing a Clinton, Tennessee mob harassing black drivers. I believe the photo dates from when twelve black students in Clinton integrated the high school. I always wonder who the people in these pictures are and if they are proud, or ashamed, to show them to their grandchildren now. What must it be like to have one of your cruellest moments recorded in Life Magazine? I also learned about the Green Book, the guide to where to find gas, lodging, food, and restrooms if you were traveling through places restricted by race–which included plenty of northern sundown towns, not just the Jim Crow South. Of course one would need something like this, but I never thought about all the things people did to accommodate a humiliating and potentially dangerous situation. Mark Knopfler wrote this song about a traveling band of gospel singers–clearly, the issue spoke to him decades later, as it does to me. The lines “We’re a long way from home, just let’s pay the man and go” are such a concise expression of the weariness of living under daily discrimination.